Summer is definitely here in the Philippines. The sun is scorching hot, the air is humid and most of all, no school classes for kids. What's great about summer here in the Philippines are the beautiful beaches. 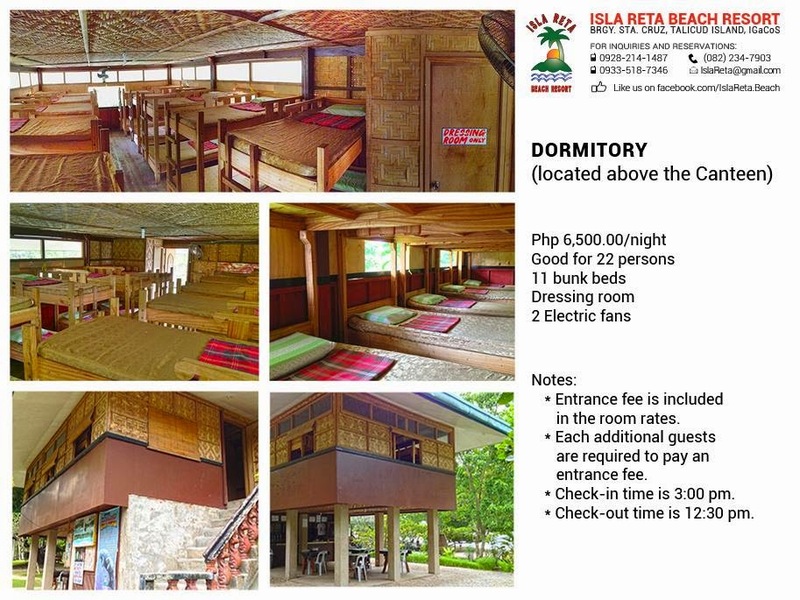 And if you want a white sand beach with pristine blue waters and beautiful shores, you should visit Isla Reta Resort. This is a place to be when you want to have fun in the sun this summertime. 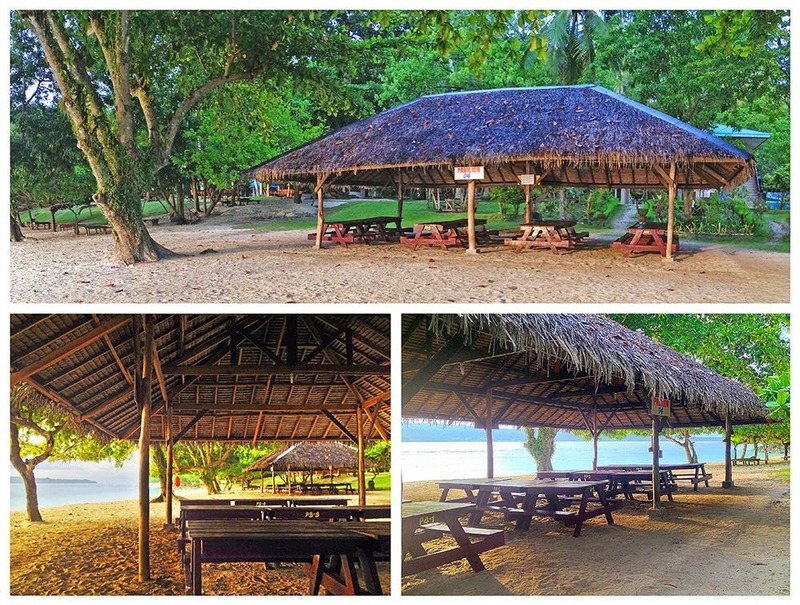 Located in the heart of Talicud Island in the Island Garden City of Samal in Davao del Norte, it is just an hour ferry drive from Davao City. Just go to Sta. 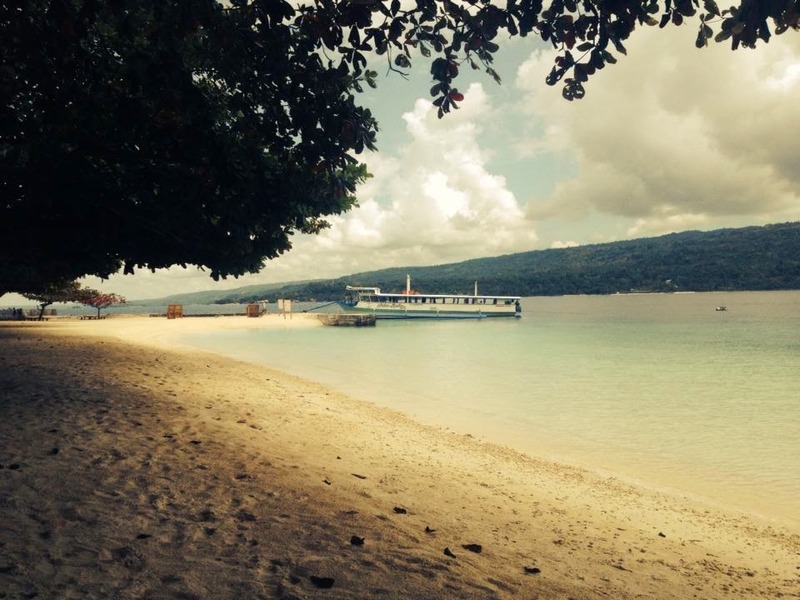 Ana Wharf and get on board their Isla Reta Boat. The boat usually departs at 9:00 am so better be early. 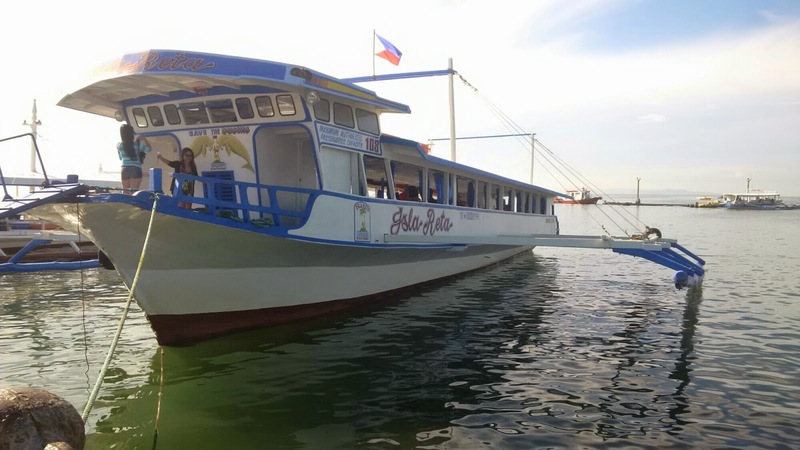 There are other boats that you can ride if you didn’t catch the Isla Reta Boat but be warned that there are only a few journeys to Talicud Island so I suggest you go to the wharf early. The fare is 80 pesos per person on a one way trip. 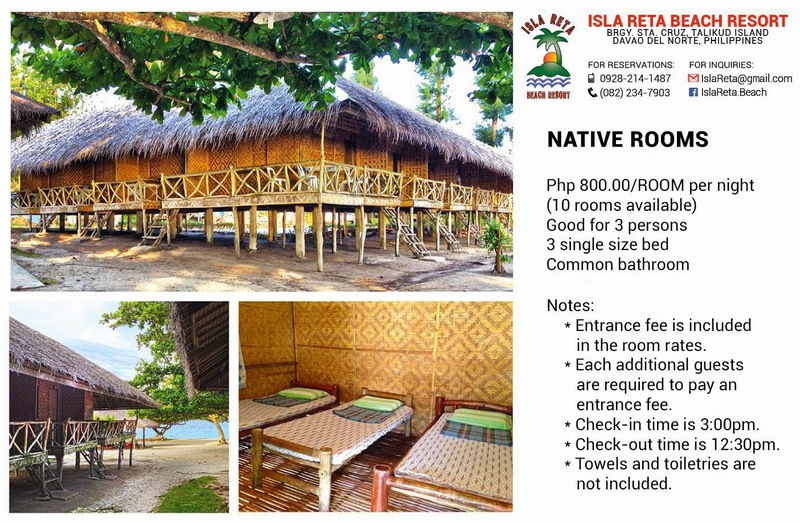 There are cottages and Nipa huts you can rent in Isla Reta so better call their office first if you want to reserve one. But take note that Isla Reta has power only from 3:00 pm to 6:00 am since it is an island, it is powered only by a generator, hence the scheduled power. If you stay overnight, you can also pitch in a tent under the Talisay trees if you want to save money. There are mattresses you can rent to be more comfortable if you plan to stay outside. 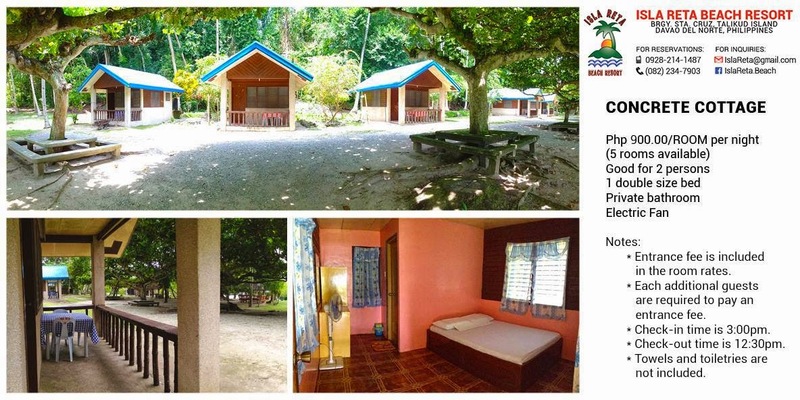 In our case, since there are no more cottages and Nipa huts available – all are fully booked, we opted to bring tents. It is fun sleeping under the big moonlight and embracing the summer wind while listening to the waves nearby. 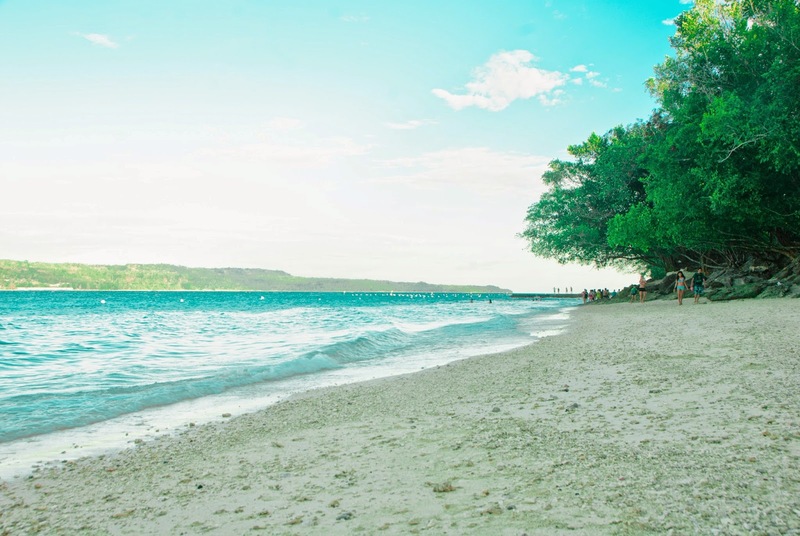 If you rave about the white sand beach of Boracay, then think Isla Reta as like that minus the bars, parties, and the major uber noise and chaos. Here, it is more of you being one with the beach and having fun swimming with your love ones. The water is sparkling clear so you could even see fishes swimming with you. 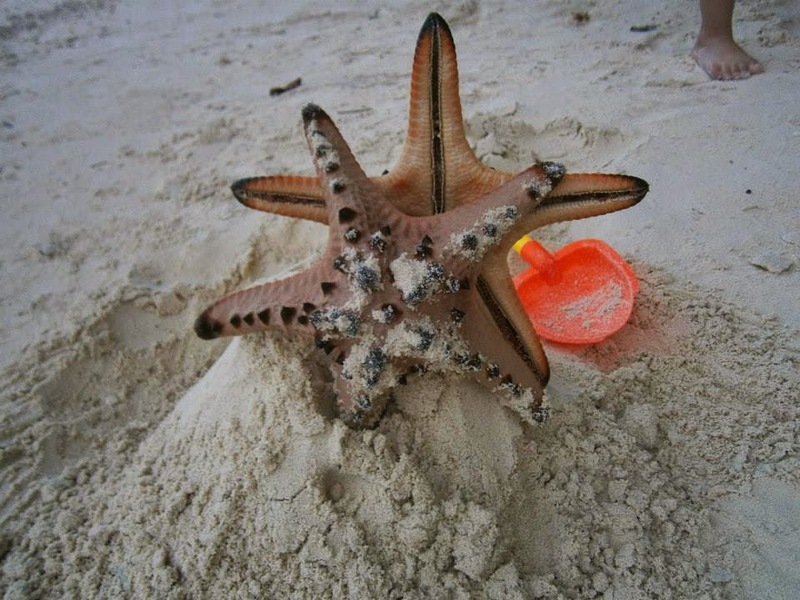 There are some far flung areas where you can see starfishes and even water snake. If you will be swimming in Isla Reta, I would suggest you wear your beach sandals because there might be some sea urchin in some areas. 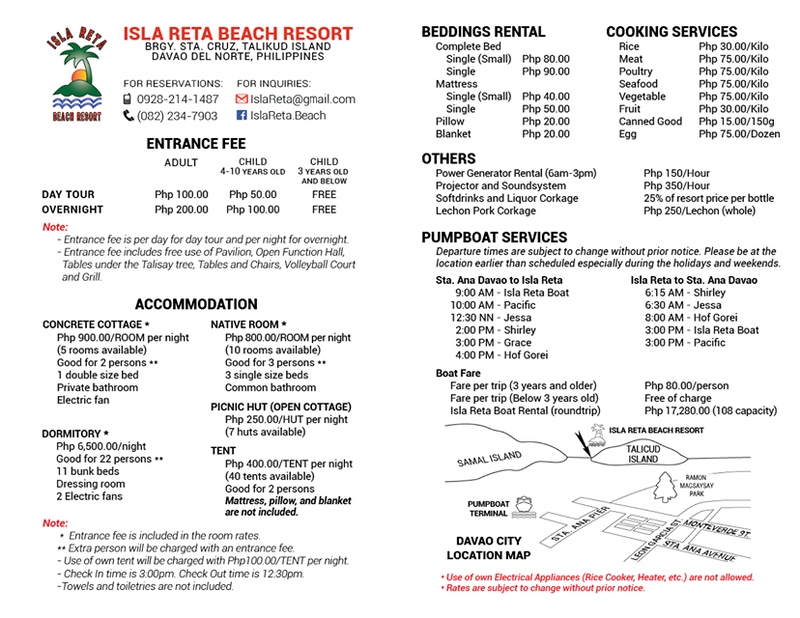 What to do in Isla Reta? 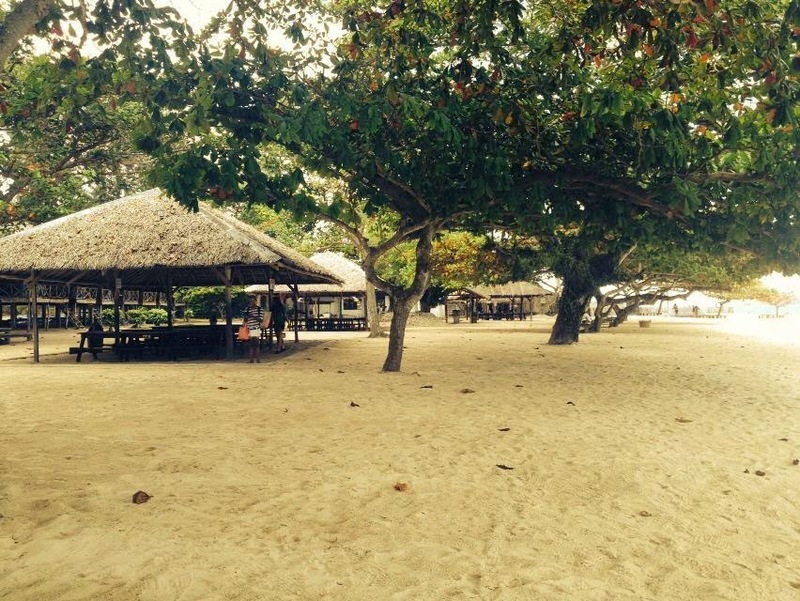 There are a lot of activities you can do in Isla Reta. Aside from the obvious swimming, you can also snorkel. Bring your snorkeling gear to see lovely corals and colorful fishes underneath the water. Some divers also go to Isla Reta to dive under the waters. 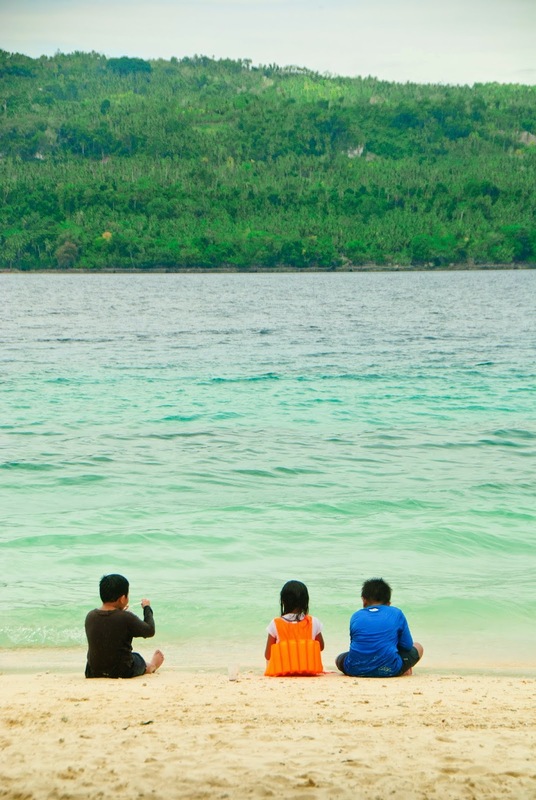 So if you are diving enthusiasts, try Isla Reta as well. If you haven’t brought with you food, you can order at their restaurant. There are good choices available at the menu which are perfect for you. But if you are on a budget but want some fresh seafood, you can just go out of the Isla Reta gates and visit a the nearby market. Fresh fishes and other seafood products are delivered daily by fishermen. Then you can just cook them if you bring cooking gears with you or just grill them up through the resort's numerous grilling stations. In our case, since we brought cooking burners, we cooked a Lapu Lapu soup, adobo octopus, kinilaw na tuna (fresh sliced tuna cooked in vinegar) as well as grilled some fishes. This would truly be a haven for people who loves seafood. 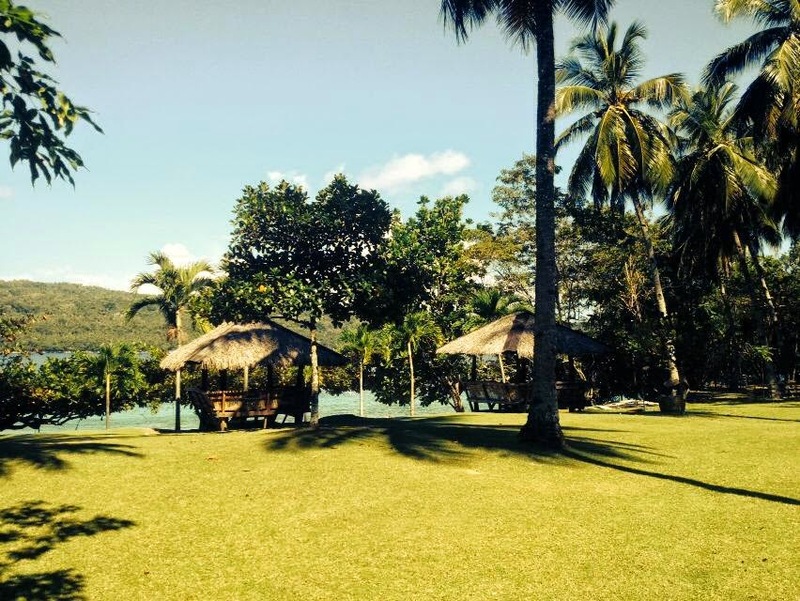 So to beat the heat this summer, go to Isla Reta and swim, have fun and enjoy the sun!